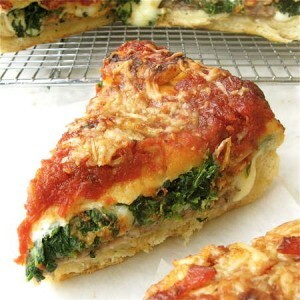 Stuffed Pizza recipe by Nazia Nazar at PakiRecipes.com. Mix all the ingredients for the pizza base with little water to make a thick batter and keep in warm place for 1 hr. Heat 1/2 tsp oil in a kadhai and fry chopped spinach , salt and ginger paste for few minutes. Keep aside. Heat a tava. Grease it with oil.When hot put a ladle full of batter and spread to make thick round. Spread spinach stufing evenly and again spread a ladle full of batter on stuffing. Cook on both sides until light golden on low flame. Likewise make for the rest of the batter. Grease a baking sheet wth little oil. Place pizza in it. Spread pizza sauce and top with all toppings ending with cheese at the top. Sprinkle with salt and pepper. Bake for 10-15 mins until cheese melts. This looks awesome! Going to have to try this for my next cookout or tailgating pizza party .